“Life has taught me to always see your glass as overflowing,” says Bi’Ja Thatch, who has survived multiple health issues. When Bi’ja Thatch was 12 years old, she hopped on a first-class plane and headed to France with her mom, older cousin and best friend. A limousine escorted them to a huge hotel where they had the luxury of ordering endless room service. For eight days and seven nights, they excitedly roamed through Paris. They went sightseeing, took mini cruises and visited the Eiffel Tower. They even spent two days at Disney World in Paris, rocking through the streets with Thatch’s favorite cartoon characters. She got on rides, took pictures, played games and ate snacks. It sounds like every kid’s dream. Thatch was just one of thousands of children at Disney World that day. However, her trip to Disney World was sponsored by the Make a Wish Foundation, which grants the wishes of American children diagnosed with life-threatening medical conditions. Thatch was not expected to live past the age of 12, and it was her dying wish to visit Paris. Thatch is now 21 and has defied the odds. She describes herself as “energetic, goofy, outgoing and happy.” An only child, Thatch was born in Chicago and lives in Middle River, Md. She has moved back and forth since childhood. At age 10, Thatch was diagnosed with auto-immune hepatitis, a chronic disease in which the body’s immune system attacks the normal components and cells. The disease heavily affects the liver, causing inflammation and leading to cirrhosis. Only one in 235,294 people in the United States have this rare disease. The immune system normally protects people from infection by identifying and destroying bacteria, viruses and other potentially harmful foreign substances, according to the National Institute of Diabetes and Digestive and Kidney Diseases. In Thatch’s case, it does the opposite. It all started when Thatch woke up one day with a bad stomachache. She had always been a healthy child so her mother shook it off thinking it was just a little constipation or an upset stomach from something she ate. When her mother found Thatch in the fetal position with unbearable pain, she immediately took her to the hospital. When the doctor began examining Thatch’s stomach, he knew that something felt terribly wrong. Thatch was immediately rushed to John Hopkins Hospital where the pediatric department found her liver was completely out of place. From this point forward, she has been in and out the hospital for treatment, surgeries and procedures. The issues with immune system caused her to have a slew of other health issues. Thatch has been diagnosed with rheumatoid polyarthritis, a chronic disease that causes pain, stiffness, swelling, and limited motion and function of many joints. The disease affects 1.3 million Americans about 75 percent of whom are women. As a result of the polyarthritis, she developed Sjögren’s syndrome, an inflammatory disease that most often affects the tear and saliva glands. Patients often notice irritation, a gritty feeling or painful burning in the eyes. She has also been diagnosed with hereditary elliptocytosis, which causes abnormally shaped red blood cells. Her latest diagnosis is hemophagocytic lymphohistiocytosis, a rare disease that causes cells to destroy each other, damaging tissues and organs. This diagnoses caused Thatch to need a bone marrow transplant. It took a year find a donor, but she did find one. “I am so grateful for this transplant, because I know many people are not as fortunate as me to make it off the waiting list,” Thatch said. With the stress of having these health issues, Thatch has also been diagnosed with depression, anxiety attacks, Post-Traumatic Stress Disorder and Obsessive-Compulsive Disorder. It would seem that these health issues are more than enough for any child to deal with growing up. But Thatch endured pain from classmates at her middle school in Baltimore during the healing process. Thatch’s medication caused weight loss, and other children often teased her about being skinny, calling her names like “chicken legs.” Being timid didn’t help matters. Thatch said her worst experience was wearing a wig after the medication caused her hair to fall out. One classmate snatched off her wig. Thatch remembers crying, screaming and walking down the hallway as staff members tried to calm her down. Thatch’s confidence reached an all-time low due to the bullying. It wasn’t until the seventh grade when she met her best friend, Ayanna, that she began to rebuild her confidence. “I don’t have ugly friends,” Ayanna would remind her. Since their friendship, Thatch began changing her attitude, dressing differently, doing her hair and taking more pride in who she was as a person. She went from being an outcast in middle school to becoming popular among her high school classmates. She became a cheerleader, joined the journalism club and delivered news every morning over the loud speaker. Thatch was also involved in the mock trial and debate team. These teams inspired her to pursue law as a career. In 2011, Thatch enrolled in Howard University as a Legal Communications major. She has particular interests in constitutional, civil, business and entertainment law. Her ultimate goal is to be a Supreme Court justice. 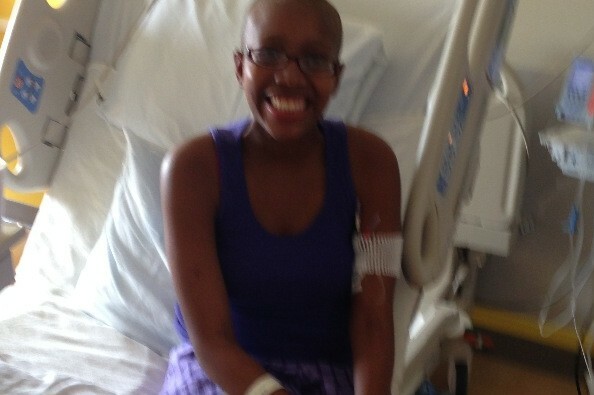 Her health complications have delayed her goal of graduating this spring. She missed several semesters, because her body couldn’t handle it. Thatch took online classes during long stays at the hospital to keep up with schoolwork as much as possible. Thatch says if her life has taught her anything, it is to remain positive, always find a reason to smile and never let things get to you, including medical expenses that prompted a GoFundMe campaign. She thanks her father, who nicknamed her “pretty girl,” and her mother, who keeps her laughing, for keeping her spirits high. Elaina Johnson writes for 101Magazine.net and the Howard University News Service. She also wants to attend medical school after completing her journalism degree.